Heissatopia: Farewell, February! Hello, March! What a downer of a month February is. It can't do anything right. It isn't even a normal length. We have a March 1 deadline that I've been thinking about this week, but all week I've been thinking, "We still have a few more days left to decide..."
BUT it's February! So we don't have a few more days left to decide because February is over! I'm glad about this because even though this winter was mild, the snow and cold we've gotten recently has been enough for me. Too bad for me, though, because there's another winter storm a-brewin'. Still, snow storms in March aren't quite as depressing as snow storms earlier in the season because even if it's snowing it feels like spring, like the world is rejuvenating (which it is). February, as the tail end of winter dreariness, is the absolute worst. My question today, though, is this: I've been alive for several Februaries (32, to be exact) so how did I not realize the end of February was already upon us? Oh, so about the picture! I had to force Zoë to come with me to pick up Benjamin today, which is great because I've been reading this book called Peaceful Parent, Happy Kids that my mom got for me. And, like, I'm all about helping children work through their emotions until I'm not. And today when we had to leave and Zoë was still throwing a fit I just picked her up, put her down in the garage and said, "We're going now. Do you want to wear shoes and a coat, or not?" Sometimes I just don't have time to deal with her emotions because we have to go (but it's something we'll work on together, I guess). She cheered up while we were on our walk and I started pointing out all the things she would have missed seeing if she hadn't come with me. These flowers were one of those things. 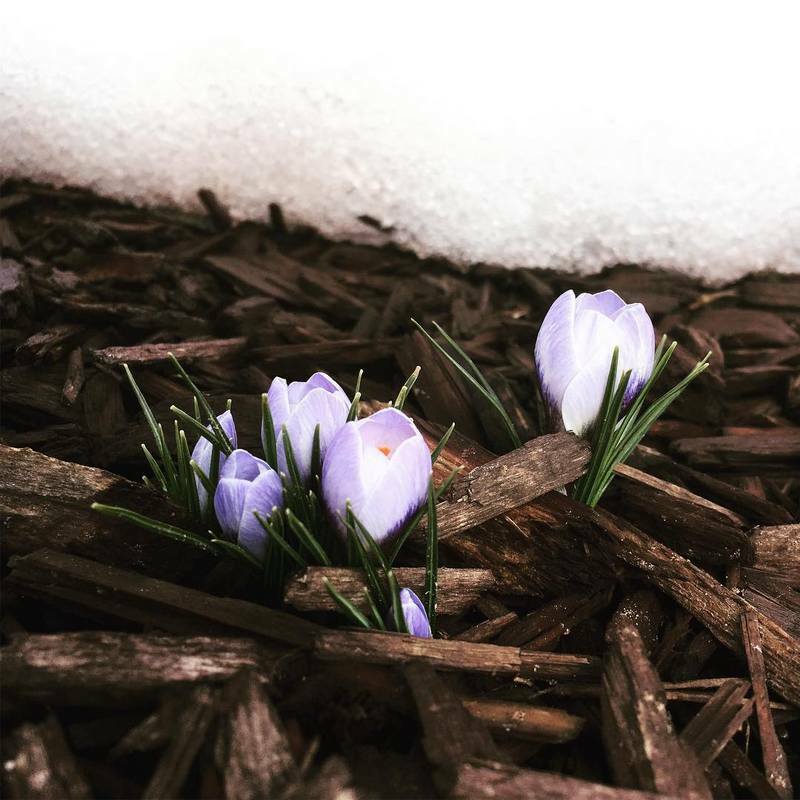 And I always love when I see the first little blossoms poking out from the snowy ground. ALSO...I just tried to type "rabbit, rabbit, rabbit" to Andrew but instead I typed, "rabbit, rabbit, rabbi" and now I can't stop laughing. Happy March! I love the hope that spring brings! Pretty picture. Happy March to you! Sometimes kids just have to know that they have to do something, end of story. That is life.